Separate the leaves from the stem, discard the stem, wash well, drain in a colander and keep aside. Chop onions and scrap the coconut. Heat oil in a kadai. Add mustard seeds, urad dhal, red and green chillies and fry until golden brown. Add chopped onion, turmeric powder and saute until translucent. Add the washed and drained drumstick leaves, salt and mix well. Cover with a lid and cook it in low flame until they are cooked soft. Add in the scraped coconut and mix well. Turn off the heat in half a minute. Serve as a side dish with rice. No need to add water as the leaves have a tendency to generate water on its own when cooked. Do not overcook as it may turn bitter. Use coconut oil if you want a typical Kerala flavour. delicious and yummy murunga keerai thoran. Healthy and colorful looking curry. Very well presented. Ohffff kothipichaloo.I rarely get them here. 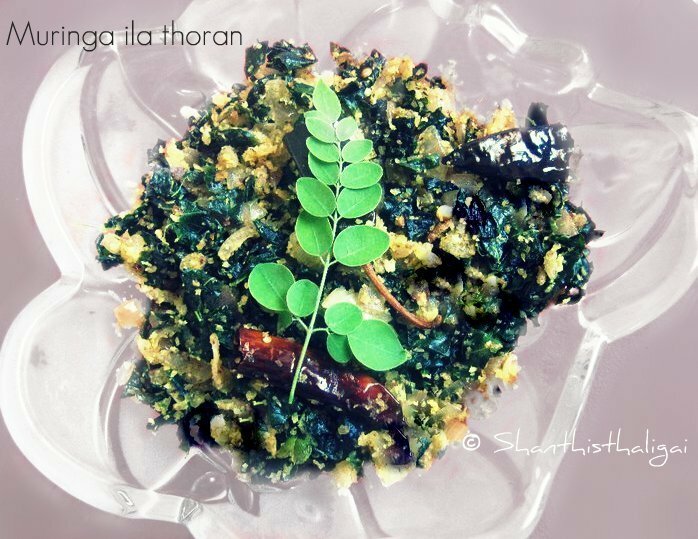 Healthy and nutritious thoran, love simply with rice. Very healthy thoran and i am very happy to follow your blog and when you have time do visit mine. One of my fav thoran.. Looks tempting ! Colorful and lovely looking kesari. Excellent preparation.